This article is about a school of art and architecture. For philosophical theories known as historicism, see historicism. Historicism or also Historism (German: Historismus) comprises artistic styles that draw their inspiration from recreating historic styles or artisans. This is especially prevalent in architecture, such as revival architecture. Through combination of different styles or implementation of new elements, historicism can create completely different aesthetics than former styles. Thus it offers a great variety of possible designs. 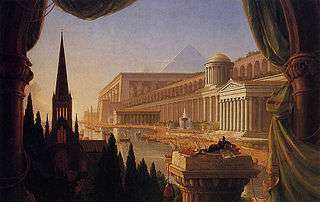 In history of art, after Neoclassicism which in the Romantic era could itself be considered a historicist movement, the 19th century saw a new historicist phase marked by an interpretation not only of Greek and Roman classicism, but also of succeeding stylistic eras, which were increasingly considered equivalent. In particular in architecture and in the genre of history painting, which increasingly painted historical subjects with great attention to accurate period detail, the global influence of historicism was especially strong from the 1850s onwards. The change is often related to the rise of the bourgeoisie during and after the Industrial Revolution. By the end of the century, in the fin de siècle, Symbolism and Art Nouveau followed by Expressionism and Modernism acted to make Historicism look outdated, although many large public commissions continued in the 20th century. The Arts and Crafts movement managed to combine a looser vernacular historicism with elements of Art Nouveau and other contemporary styles. Influences of historicism remained strong even until the 1950s in many countries. When postmodern architecture became widely popular in the 1980s, a movement of Neo-Historism followed, that is still prominent and can be found around the world, especially in representative and upper-class buildings.